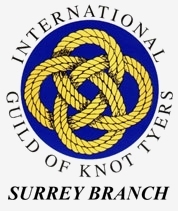 The International Guild of Knot Tyers is a non-profit making group dedicated to knots and their applications. Welcome to the Surrey Branch website, the internet home of the Surrey Six . The IGKT was formed in 1982 by 27 individuals keen to swap ideas on the craft, art and science of knotting. They met after an article on the front page of the Times about a "new knot" caused much debate and prompted comparisons with the 3800 other knots in "The Ashley Book of Knots". The founder members discussed this "new" knot and decided that it was indeed "new". They also thought that it would be a good idea to unite the knot tyers of the world, which they have been doing ever since. The members have diverse backgrounds, from authors of knotting books, craftsmen and women, professional ropemakers and riggers, as well as Scouters and Guiders, but are all united by the love of knots. Members keep in touch through a quarterly newsletter "Knotting Matters", which is distributed to members worldwide, and, of course, websites! (See the links page.) There are also full Guild meetings twice a year, usually, but not exclusively, in the UK, which give members the opportunity of meeting other enthusiasts from across the globe. Were the first county in the UK to have its own Branch of the Guild. Meet six times a year in the Guildford area. Have both speakers and practical sessions, plus Christmas and Summer social gatherings. Welcomes anybody who is interested in knots, from somebody who has just discovered knotting, to the professional user who would like to know more. Can provide a speaker to any other groups who have an interest, or would like to learn about knots and knotting.